It’s easy to forget that Miguel de Cervantes (1547-1616) lived during almost precisely the same span of years as William Shakespeare (1564-1616). Two towering luminaries expanded and redefined their national (as well as international) literatures in the identical epoch, creating some of the world’s most memorable characters. This occurred to me as I was trying to make more sense of Falstaff and the comedic elements of the play. Then it dawned on me how Shakespeare dwells upon Falstaff’s dubious status as a knight. Suddenly, when compared to that even more famous knight errant, Don Quixote, the roistering fat man fit the bill. Both Shakespeare and Cervantes, it seems, were intent on skewering the fading chivalric ethos with the overwhelming presence of knightly fools. Not the same fools, to be sure. 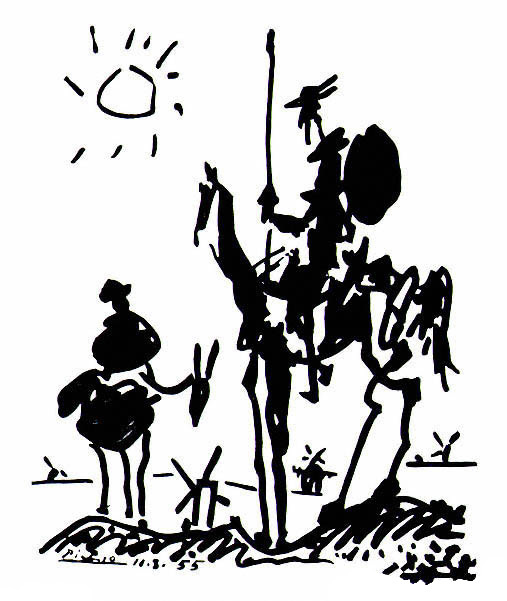 Don Quixote is lovably deluded, whereas Falstaff is laughably conniving. Both misread their current predicaments in an age when over-the-top romanticism is rapidly wearing thin. The harshest blow occurs in Act V during a famous scene in which Prince Hal, newly coronated as Henry V, disowns his former friend in front of everyone. Not only that, but he banishes Falstaff and prevents him from ever coming within ten miles of the royal presence at the cost of his life. It’s enough to make one wonder how genuinely Hal kept the friendship, ever keeping in mind his disagreement with his father, Henry IV and the long-standing plot to transform himself into a king and shock the world. But one must also remember that Hal’s role has changed now that his dad is dead and the weight of the realm has fallen upon his shoulders. He must take a stand – make a show – in as theatrical (no pun intended) a fashion as possible to convince his subjects that the Harry of old will not continue his debauchery upon the throne. It has led many to interpolate a bittersweet pride in Falstaff (portrayed particularly by Orson Welles in Chimes at Midnight), recognizing even in his own rejection how far his protégé has ascended. Our pain as audience members grows as we comprehend Falstaff’s emotional denial of the absoluteness of this rejection, attempting to convince himself that Hal doesn’t mean what he says but is merely putting on a necessary show. By causing us to feel great sympathy for Falstaff at the last, Shakespeare has managed to bring our ideas of the man full circle, confounding easy description. Falstaff is (pardon another pun) a “round” character, a full being who beggars simple labeling as either a good or bad man. He may have a good soul, as Orson Welles argues, but he sometimes has a funny way of showing it. By trying to make everything funny, he has a tendency to try and hide loose morals and cheap values, a tawdry sort of existence. He may be lovable, and forgivable…but he sure can grow tiresome. Like the newly christened King Henry, we all reach an age when it’s time to move onto more serious pursuits. Such as Henry V, in this case. The age of knights and chivalry achieved its own spectacular highs and abominable lows. But every era too reaches a point when the welcome is worn out and a new era yearns to be born. This entry was posted on 2014/04/29 at 4:48 pm and is filed under Henry IV Part 2 with tags Cervantes, Don Quixote, Pablo Picasso. You can follow any responses to this entry through the RSS 2.0 feed. You can leave a response, or trackback from your own site.